Wool, linen, cotton, and silk: from start to finish. This project started with my trip to The Woolery for a quick purchase of some fleece for my Friendship Spinners Guild meeting. I bought a pound of off-white roving, which is a blend of wool from 57 different sheep. I started spinning the yarn using long draw woolen method on my Lendrum portable spinning wheel while socializing with other spinners at the meeting. I decided to spin very thin yarn for a light-weight pullover for this exceptionally warm winter month. Off-white roving that I took to the Guild meeting. The finely-spun yarn was finished in a few days. It’s amazing how much time it takes to spin just one bobbin when the yarn is so fine! After 24-hour setting time, I plied the fibers to create a two-ply yarn for knitting. A lot of wool fits onto just one bobbin. My hand-spun yarn is being transferred from the bobbins into skeins. The next step in preparation for knitting is to wash the spun yarn. My yarn was almost white. So I decided to combine the washing with dyeing. As with everything else I produce, I use only pigments derived from nature. This time, the natural dyes are found right here on the farm. The carpet of fallen autumn leaves has transformed the forested countryside into a cinnamon-colored landscape. The bright patches of the carpeted terrain found under the hickory trees are especially attractive. I collected a few pounds of dry hickory leaves and used them to dye my wool. Dying with natural pigments is always a pleasurable experiment as one never knows what the resulting color, tone, and shade to expect. I could hardly wait to see the final color. To my great surprise, the result exceeded my expectations. I was very happy with this rich golden-brown hue. Skeins of handspun wool dyed using dry fallen hickory leaves. The washed and dyed yarn is ready for knitting now. Recently, I have been reading about Orenburg goat down lacy shawls and became intrigued by their mesmerizingly intricate patterns. Although, I want to make gossamer shawls similar in design to those of Orenburg, I decided to create something even more complex in nature: a three-dimensional garment with the elaborate lacy needlework. A pullover was the best choice for me. I had a certain design in mind: 1) some Orenburg patterns; 2) a tunic cut with three-quarter sleeves; and 3) a round yoke. My extensive search for patterns did not produce satisfying results. I am sure there is a pattern out there that would’ve been perfect for me, but I just couldn’t find it. So I decided to start knitting from scratch and create my own design in the process – sort of make a big swatch of various gossamer patterns in the shape of a tunic. After making a small stockinette swatch to measure the knit gauge, I casted on and started knitting. The lacy pattern makes the newly created fabric look very corrugated. It was turning out beautifully though. Gossamer pattern for the round yoke of the tunic. The pattern that I selected for the bodice has even more relief. In fact, the shape looks to me like an egg carton. After a garment is made, it moves on to the next step of the process – blocking. There are different types of blocking depending on the fibers used and the desired result. I decided to wet block followed by a steam block. Finished hickory gossamer tunic on the blocking table. I am satisfied with the resulting shape, pattern, color, and overall design. I already wore it once or twice before taking the picture below. When I look at this photo, I see myself in it. It is definitely me! Mixed wool hickory gossamer pullover. Below is a close up shot of the lower yoke and the bodice pattern. Close up of the gossamer pattern. 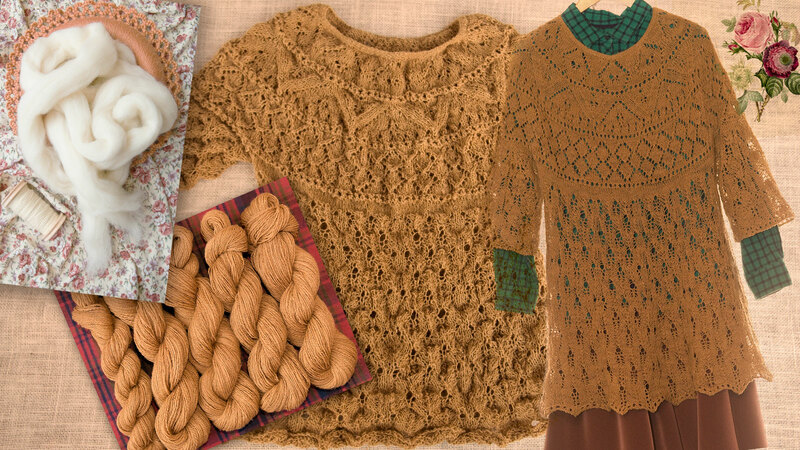 I like knitted lace garments for their beautiful look and versatility. The tunic is warm and durable enough being made with 100% wool. It feels very comfortable on warm days because of the open lace pattern. It is also quite warm when worn with a jacket over it because the holes of the gossamer pattern trap air pockets acting as an insulator. Finally, great comfort is achieved with all knitted garments are providing unrestricted movements – this tunic is not an exception. Thank you Judi! I jotted down the pattern as I was making the garment. I’ll organize my notes and will send you a pdf. Thank you for the idea to sell the pattern! I should definitely do that. Project #2: Gossamer pullover from farm to fashion.